We laid our work and burdens down to observe a lightning bug. That meant letting go the shovel and dishtowel. The prodigal. Naysayer. We lifted our heads at dusk to glimpse summer’s first golden wink—the winged beetle’s signal of survival. After several weeks of drought, the first sight of their bioluminescence surprised us. Although countless generations of children have trapped them in canning jars and smeared their tails on their skin for amusement, glowworms have thrived to mate nonetheless. Here, there. Everywhere, the language of blinking lights. They flew in like family to celebrate the longest day of the year, to allure us with their laser show. They called us to sit and rest—to witness Nature’s faithfulness and handiwork. The air was calm without mosquitoes. We lingered upon the hilltop where the sweep of land and sky grew darker and the twinkling light brighter. I wished every living thing on our dear planet could sense this sublime passage of time and season. For God designed all creatures great and small with a portion of the firefly’s “glow” element: adenosine triphosphate, the chemical that converts energy within cells for metabolism. What a marvelous thought as nightfall enveloped this Summer Solstice: we’re all born to shine. It is a matter of heat and humidity for the firefly. Forests, fields, rivers, ponds, and streams provide the ideal habitat to trigger the insect’s ATP. 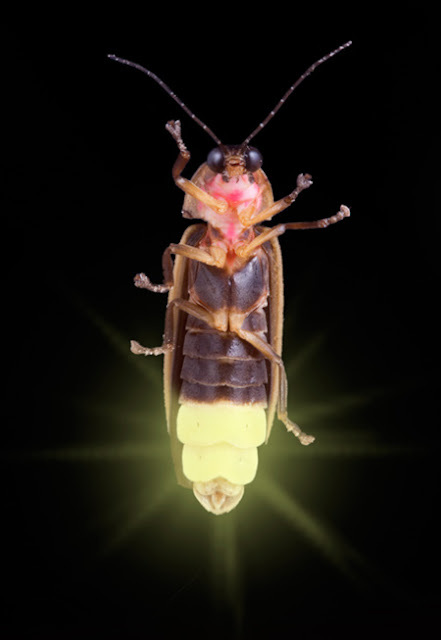 According to firefly.org, the Great Smoky Mountains National Park and the Allegheny National Park attract a species of firefly that lights in synchronization. Their performance ranges from mid-May to mid-June for smart folk who purchase tickets in advance and shuttle into the forest for the sold-out show. Sounds like the perfect vacation to me. And in Southeast Asia, another genus of firefly glows in mangrove forests year round. Imagine that. Some species illuminate during all four stages of its life cycle. I’ll have to find naturalist Terry Lynch, a firefly specialist, and ask if that species has a higher ATP level than the common lightning bug. And I’d like more information on treating human diseases with doses of ATP. Meanwhile, there’s plenty standing water down our road and tall grasses behind our property for firefly eggs and larvae to propagate. I am concerned, though, about development’s light and noise pollution creeping up from south of us. Mr. Lynch recommends planting pine trees to provide a canopy of shade and sound barrier that fireflies need to find a mate. Furthermore, in the future I’ll refrain from raking needles from our white pine cove because firefly larvae feed on earthworms and other small animals that feed in pine litter. For this Appalachian Michigander and her mate, the calm, summertime twilight is reserved for watching fireflies, the glow of a resilient bug that speaks of the simple pleasures of childhood. Dear Reader, in their short lifespan, their love language reminds me to lay disappointment down and let my light shine.